The IMX 45 has always been considered a great boat: fast, nice to sail, suitable also for sporty but comfortable cruises, with the only drawback to be a bit too much penalized by rating rules, and therefore not capable to repeat the overall success of the smaller sister IMX 40. Rating rules changes and also for this boat a better time was to come. This was confirmed when the owners of the Dufour 44 Giumat replaced their boat with one of the few IMX 45 with shallow draft keel, and asked our Studio to do the best to upgrade her to be competitive in the highest level of ORC / IRC regattas. Therefore the original lower part of the bulb with the peculiar X-Yachts “shoe” shape was replaced by a deeper fin+bulb lead part, and the whole keel reshaped increasing lateral area and following newer laminar airfoil sections. Also the rudder blade was rebuilt on the existing aluminum stock, and sailplan optimized moving forestay to bow, replacing big overlapping genoas with small 110% jibs and other smaller upgrades. 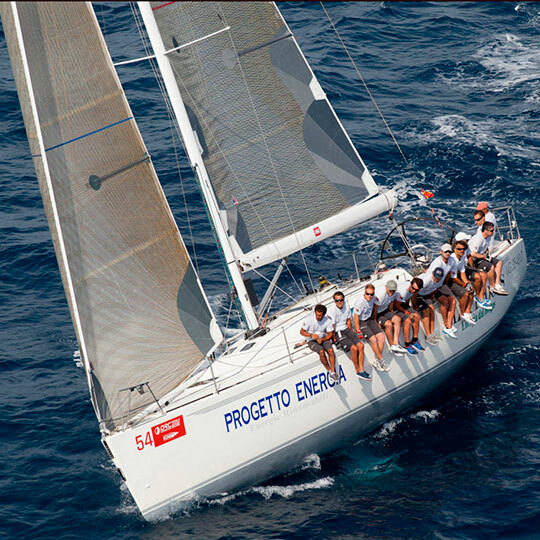 The result was very good: after a good preparation with convincing inshore and offshore results, for example winning her class and 3rd overall at 151 Miglia of 2014, Trusendi brothers brought the boat to Barcelona for 2015 Worlds, were they arrived 6th in the very competitive B division, scoring three daily victories, the only boat in the fleet to do that. The following year we were contacted by a Brazilian IMX 45 owner to update his boat, following the success of Giumat. Maximus, this is the boat name, was a standard deep keel IMX 45; the optimization plan was similar in concept to the one of the Italian boat, but different in details, being the starting point a totally different keel. The result was also in this case very good with a 2nd place overall in Brazilian Championship and many other good placements.